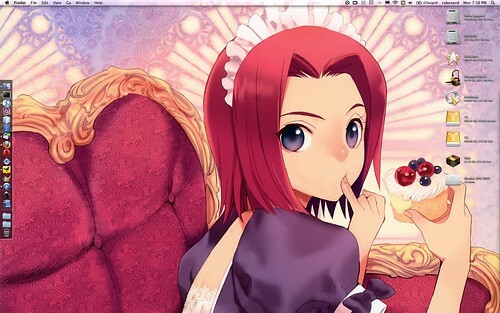 Perhaps now the Konachan folks have their hosting problems down pat they've been paying attention to The Monnie's Cupcake Camp here in Adelaide (perhaps they have operatives tapping her phones), because their latest Code Geass desktop background wallpaper is this pretty colourful one of Kallen with a cupcake. It's adorable ^_^. Better still it's 1920×1200 so I can scale it for my little ThinkPad X40 or use it full size on my MacBook Pro's external 24 inch Samsung display at full resolution which is sweet. Get it? Cupcake? Sweet? Hey, I thought it was funny. I'm so stressed about exams I'm starting to say even sillier things it seems.